We've all got some nostalgia for computing days gone by, and you have to admit there's a little corner of your heart that lights up at the thought of Windows 95, right? Right?! Well Microsoft wants you to dig in and find it by taking a trip down memory lane with its new, re-invented web-version of Hover, a Win95 classic. 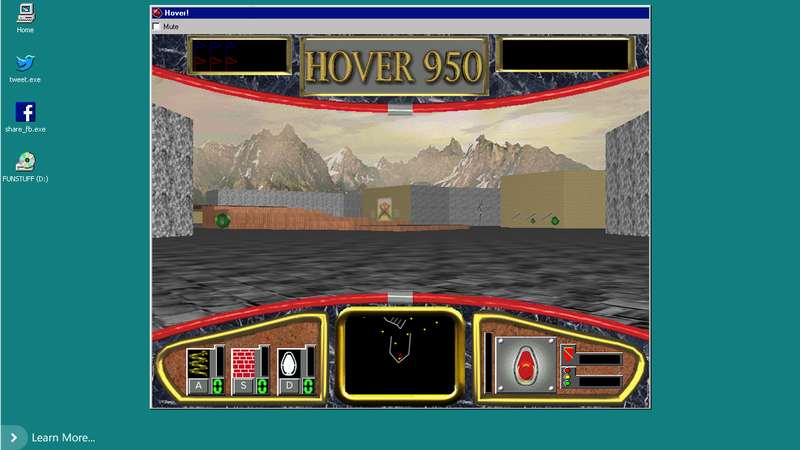 For those of you who are unfamiliar, Hover was a little bumper-car-capture-the-flag game that came packed in with Windows 95, tucked away in a little folder titled "Fun Stuff," right next to a video for Weezer's "Buddy Holly." Yeah! 90s! Now, Microsoft has resurrected those tired bones as a more modern experience that takes place entirely on the web to showcase the power of Internet Explorer 11, but it'll also work in pretty much any other desktop browser. Touch controls, though, are a IE 11 special. You can try it out over at Hover.ie. It's fun! But the real treat is hidden a little deeper. If you type "bambi"—the original game's original code-name—on the start screen, it'll shoot you back into retro 1995 mode which replicates the original game, complete with fake desktop, and fake social media applications with fake installers. It's actually pretty rad. Naturally, this isn't just a Fun Thing, but also a call to developers to create other such things—preferably with IE 11 in mind. To that end, there's a whole bunch of how-to info for developers. But as far as Fun Things go, it's a pretty good one. Go check it out!